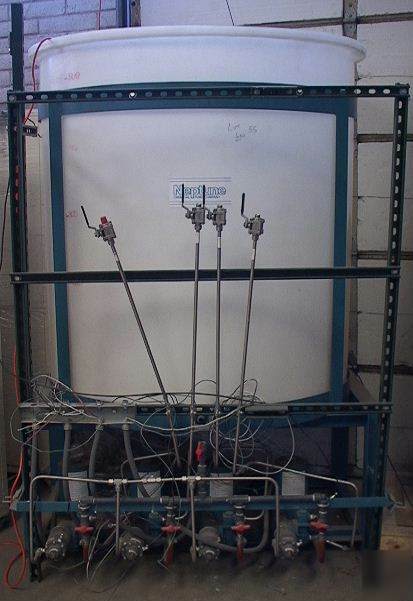 2000 Liter (500 gallon) Neptune Chemical Mix Tank with four 7-gph 900 psi proportioning or metering pumps and stand. Click the following link for the factory website. The previous user marked the 500 gallon level as shown above. The molded 2000 liter level is shown below but was hard to image clearly. We have added 10 additional images related to the Neptune Chemical Proportioning pumps with Moore Valve Positioners and links to the factories. Click the following link for documentation on the valve positioner. While the tank is a bit over 4 feet in diameter and 5 feet tall, the overall dimensions of the unit are about 5' by 5' by 88" tall. There are 4 Whitey Stainless ball valves rated for 2200 psi included as shown above and below. Might be just what you need for your really serious industrial chemical mixing tank application. Condition looks very good used. Not tested. Will consider parting. We have not cleaned this for pictures-it has been sitting in a dusy warehouse so slight oil seepage has collected dust and made it look dirtier than merited.